Blog to End the Occupation: Free Gaza! Many of you have already heard the news that the Israeli navy has surrounded and boarded the Free Gaza Movement ship Spirit of Humanity while en route to the Gaza Strip, and has prevented the ship from completing its voyage. 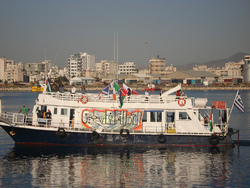 The ship, its crew, and passengers were on their way to deliver humanitarian and rebuilding supplies to the Gaza Strip. At no time did they enter Israeli waters. The ship and those on board have now been taken to an Israeli port. We are waiting for updates on the status of the boat, its crew, and passengers. For updates, please see the Free Gaza Movement website. The Huffington Post is also carrying an article on the Free Gaza boat. Just before the boat was boarded, US Campaign Advisory Board member and Free Gaza Movement chair Huwaida Arraf issued the following statement: "No one could possibly believe that our small boat constitutes any sort of threat to Israel. We carry medical and reconstruction supplies, and children's toys. Our passengers include a Nobel peace prize laureate and a former U.S. congressperson. Our boat was searched and received a security clearance by Cypriot Port Authorities before we departed, and at no time did we ever approach Israeli waters." Arraf continued, "Israel's deliberate and premeditated attack on our unarmed boat is a clear violation of international law and we demand our immediate and unconditional release." Take action to demand that Israel release these prisoners, illegally kidnapped in international waters, and allow them to complete their mission!